Music From The Future - "Explicit Electronica"
Colorado-based electronic musician Marcel Peelen returns with a new collection of adventurous space music. What had grabbed me about his previous release, "Random Noise Generation", was his ability to meet the challenge of creating floating electronica that breaks out beyond mere New Age by being meditative but also creatively complex. 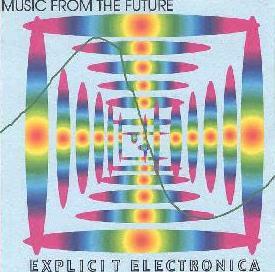 "Explicit Electronica" carries on in this spirit and even extends it a bit on a few tracks. Among the highlights is "Day Of The Great Blue Heron", which travels into freakier space territory than the previous CD. There is a basic electro-percussion beat and floating synth lines, but also a small banquet of varied synth noodlings that give a welcome element of cosmic chaos to the music. "Pulses" features very cool bubbling synth patterns alongside an eerie soaring melody. Things build to intense levels as increasing layers of electronics join the fray and there are some highly cosmic freakout moments. "TD"... I wonder if this stands for Tangerine Dream? The music certainly has a Tangerine Dream sound to it in which orchestral melodies provide the backdrop for a rapid sequenced pattern. Marcel also explores more beat-oriented, even danceable, yet still adventurous territory on a few tracks. "Triple Black Diamond" includes driving rave styled electronica, but is well beyond simplistic dancefloor madness. Mucho freaky sounds gurgle and pulse around the incessant pounding beat. "Twice" is a similar tune, but more tribal in nature. Careful mixing ensures that the beats blast back and forth from left to right so that the listener feels the sonic assault. I sure did! I really liked the off-balance rhythms Marcel fits very nicely into the established pattern. And "Fantasy Grrl" consists of a well done focus on both rhythm and sound, combining a floating synth line with a rising and falling sequenced pattern. I liked the way the contrasting sounds blended to produce music that is equally ethereal and brain jarring. I gave "Random Noise Generation" a fresh listen after hearing this new one a few times and I think my preferences are tending towards "Explicit Electronica" as some of the tracks have a more freeform feel, resulting in some freakier space explorations. The combination of multiple and varied sounds and synth patterns makes the music far more interesting than much of the current available electronica. Newcomers to Marcel's music would benefit equally from starting with either release. For more information you can visit Marcel Peelen at http://www.peakpeak.com/~synthman or http://www.my.treeway.com/m2kplus. CLICK HERE to read the review of "Random Noise Generation" and interview with Marcel Peelen that appeared in Aural Innovations #6.